As President Donald Trump pronounced the evils of socialism during the 2019 State of the Union address, many Democratic politicians and presidential hopefuls continued to call for more liberal and socialist policies, such as Medicare for All, higher taxes for the wealthy, and free public college. In recent years, the debate between socialism and capitalism in America has come to the forefront of popular discussion. Thanks, in part, to politicians like Sen. Bernie Sanders (I-VT) and Rep. Alexandria Ocasio-Cortez (D-NY) and continued grassroots equality movements, like #MeToo and Black Lives Matter. But do Americans believe that capitalism is synonymous with being American? The majority of Americans (56 percent) say that believing capitalism is the best economic system is important for being truly American, according to a recent PRRI survey. But attitudes are split on party, religion, and generational lines. The starkest division on this issue runs along on partisan lines. Nearly eight in 10 (79 percent) Republicans say that believing capitalism is the best economic system is important for being truly American. Conversely, independents and Democrats were less likely to believe this, with less than half of independents (49 percent) and Democrats (46 percent) rating this as important for being truly American. Opinions on this issue also vary greatly by religious tradition. 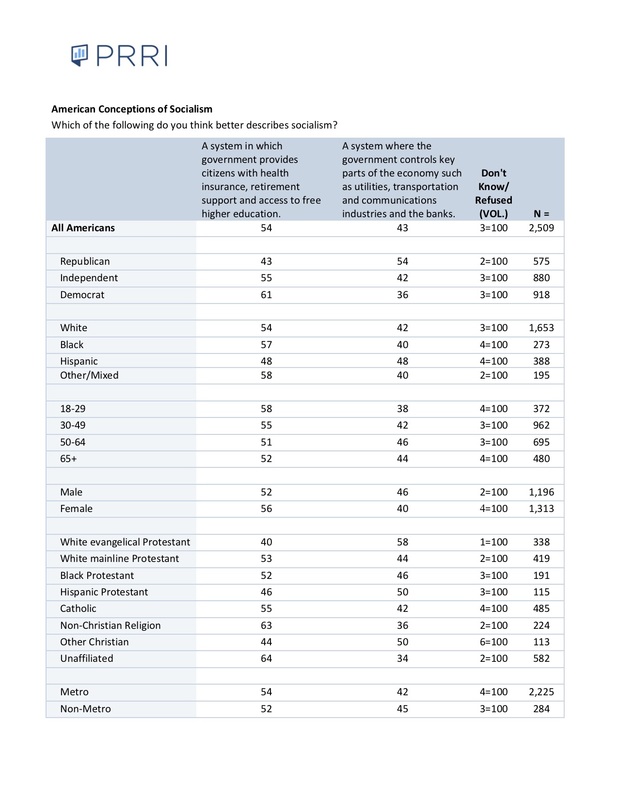 Over seven in 10 (71 percent) white evangelical Protestants agreed that capitalism is important for being truly American, compared to 64 percent of white mainline Protestants, 57 percent of nonwhite Protestants, and 59 percent of Catholics. Only 45 percent of religiously unaffiliated Americans agreed that thinking capitalism is the best economic system is important for being truly American. Support for capitalism is also divided along generational lines. While 71 percent of seniors say that believing capitalism is the best economic system is important for being truly American, only 47 percent of young Americans (ages 18-29) say the same. White (60 percent) and Hispanic (56 percent) Americans were also more likely than black Americans (41 percent) to say believing in capitalism is important for being truly American. Following Sanders’ recent announcement that he would seek the Democratic nomination in 2020, the debate between socialism and capitalism is sure to continue.